Danny Lloyd (front) and Ricky Miller celebrate Posh's winning goal at Fleetwood. Photo: Joe Dent/theposh.com. 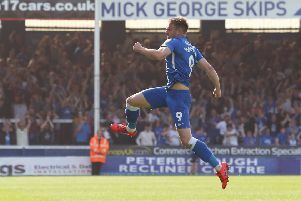 Peterborough United are prepared to sacrifice summer signing Danny Lloyd as they attempt to build a League One promotion-winning squad in January. Lloyd, who scored the winning goal in Sunday’s (December 17) 3-2 League One success at Fleetwood, has been attracting interest from other Football League clubs. Posh midfielder Callum Chettle (left) is going on loan to Fylde. The 26 year old has been on the fringes of the first team since moving to Posh on a free transfer from Stockport in the summer. Lloyd is six months into a three-year contract. Posh have placed Lloyd on the transfer list with the agreement of the player’s agent. Striker Ricky Miller, another summer signing, and midfielders Jordan Nicholson, Callum Chettle and Adil Nabi were also made available for transfer. Chettle is expected to join National League side Fylde on loan on January 1. Posh want a fee for Miller and have given him permission to speak to an interested League Two side. It’s not Cambridge United, but Lincoln City did show an interest in the 28 year-old earlier this month. Adil Nabi (left) in a rare Posh action photo. Miller has yet to score for Posh. He has suffered off-field as well as on-field problems. Posh director of football Barry Fry said: “Three Football League clubs made enquiries about Danny Lloyd having picked up on him being left out of the side a lot. “His agent then became involved and there is obviously some frustration with Danny’s progress there. “There is no doubt Grant McCann doesn’t want Danny to go. He’s a great lad around the place and the manager says he is an important part of his squad. “But we agreed to put his name on the list to see what happened and more clubs have now shown an interest. They would have to offer decent money to make us even consider letting him go, but it might happen. We do have to get players out before we can bring some new ones in though so we have some hard thinking to do. “Danny is aware of everything. If we do get the players we want he might slip further down the pecking order, but we have no doubts this won’t affect the effort he gives to our club. “We do have targets of our own in January and I’ve done deals with clubs about new players, but we have to get our players out first. “We are trying for a new striker so Ricky Miller could be surplus to requirements. There is interest in him, but we expect a fee. “Callum Chettle was told this morning (December 20) about Fylde’s interest and will leave in January.